Making rockets is a playground for the billionaires right now, and it turns out that yesterday Amazon's CEO Jeff Bezos beat PayPal founder Elon Musk to a rather significant rocketry first. 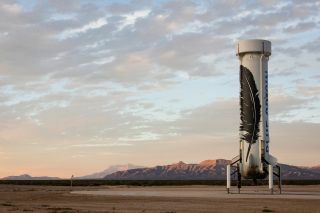 Bezos's Blue Origin is less known than Musk's SpaceX, yet it was Blue Origin that has now managed to successfully land a BE-3 rocket smoothly on the ground first. This is a significant achievement as it paves the way for reusable rockets in the future - which will be an important step towards making space travel affordable. Perched atop the BE-3 is the New Shepard capsule where in the future astronauts and cargo will sit. As this was just a test launch though, the capsule came back to earth and landed safely with parachutes. The BE-3 fell back to Earth with its engines firing when it was 5000 feet above ground. It was then able to make a controlled landing at a gentle 4.4mph. Amazingly it managed to land only 4.5 feet off of the original launch pad. Prior to this launch SpaceX had been trying to achieve similar, carrying out two higher profile launches of its own Falcon rockets and attempting to land them a floating barge platform. But while it came close both times, the rockets still ended up crashing. Elon Musk has yet to react to his rival's success on Twitter - though we're guessing that he might be thinking twice about renewing his Amazon Prime subscription. You can watch the landing in the video below which the company has produced showcasing the achievement.